Ian was born in Dinas Powys in 1966, the youngest of three children. As a young child he attended St Andrews Church in Dinas Powys, but then moved to All Saints Church in Penarth when his father became organist at that church. Beginning his working life he was taken on as part of the management development programme at Commercial Union and later worked as a Commercial Insurance Broker, specialising in business insurances. In 1998 Ian began training for the ordained ministry at St Michael's College in Llandaff and was ordained Deacon in 2000 and Priest in 2001, both at Llandaff Cathedral. 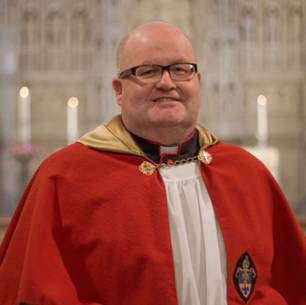 He served in Barry, Grangetown and Pyle in Llandaff diocese before moving to Swansea and Brecon diocese where he has served in Llandrindod, Gowerton and, since June 2016, in Central Swansea. He was made a Canon in Brecon Cathedral in April 2016. He also serves as the Bishop's Officer for Calling & Discipleship, which involves lay ministry training and working with people who are exploring their vocations. He is also the Warden of Readers for the Diocese. He is married to Helen and they have a daughter Jessica, son in law Gary and three grand children, Jack, Ryan and Katie. Ian is a keen sports follower, particularly rugby, football and cricket.